The Public images are © Universal Pictures. All Rights Reserved. In spite of a prolific career making films, many of us will forever behold Emilio Estevez (The Way; Bobby; The Breakfast Club; The Mighty Ducks) holed up in a library as part of a motley crew of (seemingly) mismatched misfits. Now, some thirty-odd years later, we get to return to the library in a somewhat grown-up version of The Breakfast Club. Once again, Estevez is spending an extended period of time amid rows of bookshelves. 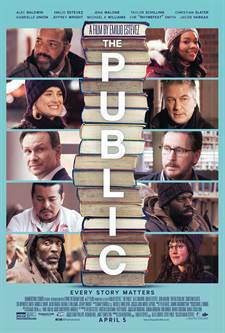 This time as writer, director, producer, and star of the provocative, heartwarming, inspiring film The Public. If you recall Andrew (Estevez in The Breakfast Club because, yes, apparently, some people don't know things) dancing around the library during Saturday detention (as I fondly do), this film gives us adult Andrew. Except that he now goes by the name Stuart Goodson, and he's a librarian at the Cincinnati Public Library. Stuart spends his days amidst the wacky mundanity of eccentricities that is "the public" library…" one of the last true bastions of democracy in action." He and his co-workers, Ernesto (Jacob Vargas; Sons of Anarchy; Traffic; Bobby) and Myra (Jena Malone; Hunger Games; Neon Demon), approach their community of new and regular patrons (many of whom are homeless) with benevolence, and comedic sensibility. We all navigate the humdrum routine of our lives peppered with varying issues and struggles. There are times that we survive; times in which we thrive. It's what makes us human, and gives us humanity. It's where we find our humor to carry us through it all. The Public manages to encapsulate this while shining the spotlight on access to public spaces...libraries, in particular. It also dispels the gross misconception that librarians have a cush job highlighted when building manager, Angela (Taylor Schilling of OITNB; The Prodigy; FAM-I-LY) banters that it "must be nice to have a job where you get to sit around & read all day." It is at the downtown public library, referred to simply as "the public" by its regular patrons, that we encounter the "intersectionality" of people, their needs, and the "seemingly insurmountable issues" with which we are all burdened. At what point, however, do we set aside our personal obligations and duties and, instead, remove ourselves as one of the many gatekeepers in life. As Stuart's couch activist co-worker, Myra, insightfully admits, "the hardest part here is knowing which side of right we're walking on." How do we know, even understand, when obligation turns into a "moral imperative." Well, the folks at The Public are about to find out, as their compassion, courage, and commitment are about to be tested. It's where the eye-opening fun begins. Davis' emergence during the stand-off leads to the escalation of events. Yes, a stand-off ensues. Earlier Stuart endured a meeting rife with tension in which he was chastised for his handling of a malodorous patron. Temperaments collide leading to quotable snipes. Ultimately, it is the precursor to the larger showdown. As lack of information leads to misinformation, the occupation is handled as a hostage situation further aggravated by media sensationalism. Portrayed by acclaimed stage and screen actor, Jeffrey Wright (O.G. ; Westworld; Angels In America), Anderson is the library director, and one of the many gatekeepers in this thoughtful, and thought-provoking film. There is a quietude to Anderson's demeanor that he manages to maintain even when defying the authorities (which I will leave at that to avoid spoilers). The "authorities" consisting of the deplorable Davis, and police negotiator, Detective Bill Ramsted (Alec Baldwin; Glengarry Glen Ross; The Boss Baby; 30 Rock). While the film tackles subject matter that could easily have resulted in content for a more mature audience, the intention was to make it accessible to a greater audience, and one of all ages. Estevez succeeded in obtaining a PG-13 rating. Sensitive material is handled with a comedic sincerity that serves to engage a wider audience but never belittles the message or the plight. Estevez captures the seemingly unremarkable existence of a librarian and transforms the perception of idleness into reality. The reality is that librarians are custodians of "the right to freedom of information." They are guides to the many that gather for: "story time"; internet access to apply for a job or stay in touch with family; access to learning; and, so much more. The reality is one that shames the question, "Do people even go to the library anymore?" He also presents us with a cadre of individuals all with the commonality of confronting, enduring, and overcoming our struggles. Standing out from this group are some of the homeless patrons. There's a warmth in the regularity of these patrons...the comradery, and protectiveness that they share. Big George is masterfully brought to life by Grammy, Golden Globe and Academy Award-winning writer/artist Che "Rhymefest" Smith. His towering presence is shadowed by the kind, tenderness that Big George embodies. Acclaimed actor Michael Kenneth Williams (The Wire; 12 Years a Slave; Hap & Leonard) is the de-facto mayor of the group, Jackson. Jackson is the insightful, wise-cracking, US veteran mouthpiece of the resistance. Early in the film, Anderson's proclamation that "the right to the freedom of information is a core librarian tenant" is weightier when we see how we are all gatekeepers who can hold information hostage, and manipulate it to suit our needs. Stuart himself "weaponizes" literature when quoting the Grapes of Wrath utilizing it as both proclamation and declaration...to which Detective Ramsted quips "Goodson, your intellectual vanity is breathtaking." A line eloquently delivered by Baldwin in a way that only Baldwin can. When dissected, The Public could seem an ambitious effort given the amount of material and information at hand. However, it achieves a global appeal and fluidity hitting intellectual and entertaining notes alike. It is a film to enjoy that will hopefully spark discussion, as well. Inspired by an essay by a retired public library director that resonated with his own personal observations, The Public is a film by Emilio Estevez with Hammerstone Studios; in association with Living the Dream Films. Distributed by Universal Pictures Entertainment.